Trains and buses from New Jersey (especially the north) to Newark Liberty Airport and New York City (Penn Station and the Port Authority Bus Terminal). The "NJ" is for New Jersey, of course, and that's the region served by these trains and buses—especially northern New Jersey, with lines feeding like spider webs into New York City. 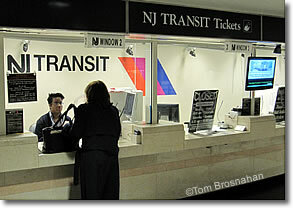 You can take a NJ Transit train or bus from various parts of New Jersey to New York City. Several routes stop at Newark Liberty International Airport before reaching Manhattan. at Penn Station, New York City.